eyeCam2 lets you see and hear your own security, web, pet or nanny cameras. Just about any camera that can be viewed over the web can be viewed simply in a native iOS interface with eyeCam. 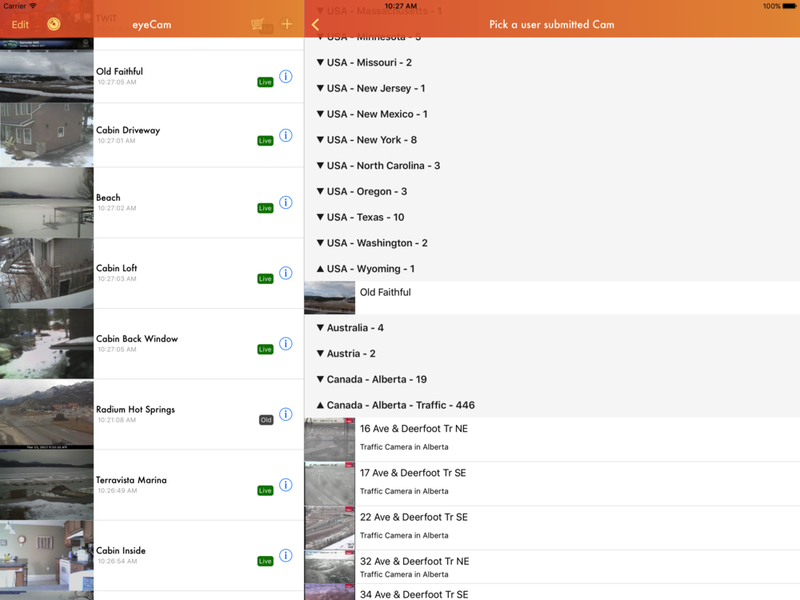 eyeCam also includes a directory of user-submitted publicly accessible cameras, so you can see traffic conditions, weather conditions and be an armchair tourist. eyeCam makes it possible to view, hear AND control your WEB ACCESSIBLE webcams from anywhere on your iPhone or iPod Touch. Quickly flip between up to hundreds of cameras, and see them all at a glance. Virtually any web-accessible webcam, netcam, ipcam, security camera, traffic cam, pet cam, nanny cam, etc. will work with eyeCam. Your camera list is synced between devices using iCloud, and your passwords are securely stored and synced using KeyChain. 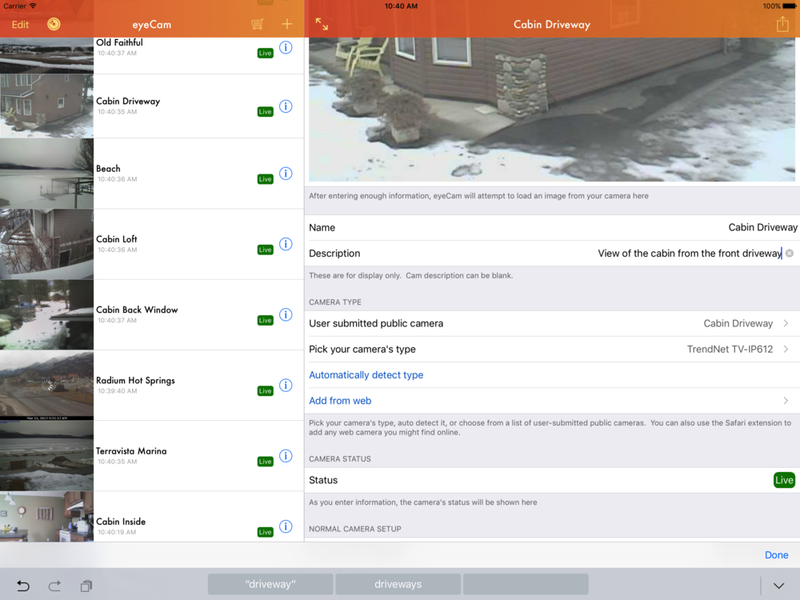 eyeCam can view nearly any public web, and has a built in directory of hundreds you can add with a few taps. 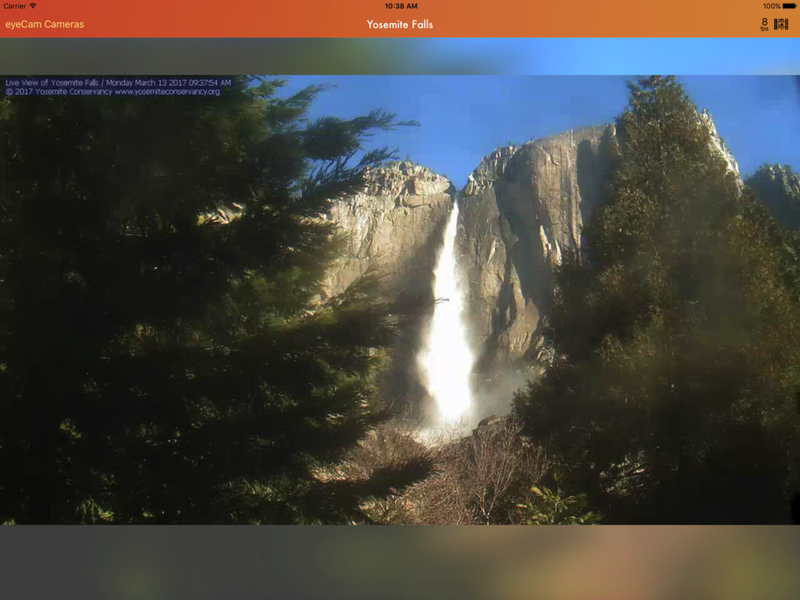 A Safari extension allows you to quickly add public cameras that you find on the web so you can view all your favourite cams in one place. As always, eyeCam support many PTZ cameras, now with sound and support for most popular video codecs and transport methods. Contact us at electrollama@gmail.com if your cam isn't on the list and we'll see what we can do. If you're still using the clunky web interface to view your cameras on the go, or have already given up on it, give eyeCam a try today! If your camera is not supported, contact me, and I can probably get it supported in short order. Contact me at electrollama@gmail.com if you have any questions. eyeCam is supported by advertisements that can be removed with an in-app subscription. Currently this is $0.99USD monthly or $9.99USD yearly, or the equivalent in your local App Store's currency. Subscriptions are charged by iTunes either monthly or yearly and will auto-renew if not cancelled within 24 hours of the current subscription. Subscriptions and renewals are managed via the App Store, auto-renewal can be turned off at any time by changing your Apple ID settings in the App Store. eyeCam2 is available in the app store.